In retrospect, the first Razer Blade only seemed insane because we'd gone down such a preposterous path with gaming laptops. Bigger, huger, less practical. Then Razer decided to bring premium gaming back to regular computers. Its first outing succeeded with looks, but choppy gameplay fell way short of "premium." The new Blade is its stab at making that right. A 17-inch desktop replacement gaming laptop that you might actually take off your desk. Anyone who's ever (insanely) decided to spec out a MacBook with the best guts "so I can game on it." Stop. Shut up. Get this instead. Not much has changed in the past few months. The Blade is largely the same as it was back then on the outside. It's a 17-inch, black, anodized aluminum laptop that's 0.8 inches thick—big, but not so heavy you can't or won't carry it around. The matte 1080p display is decent, but it won't blow you away with color or brightness or viewing angle. That's partially a tradeoff for remaining matte to reduce glare, but the downside is getting really solid gaming performance at relatively high settings and having to wonder what that would look like on a pristine display. For non-gaming, especially with a mouse, the Blade simply feels like you're using a really good 17-inch laptop. You're not going to be cranking max visuals on top-tier graphical games with the Blade's Nvidia GTX 660M. But you can get kind of close. That's a big improvement over the previous Blade, which stuttered and and choked on even basic settings with its GT 555M. Battlefield 3 ran at about 40 FPS on High settings, and was a playable 30 or so on Ultra on a few maps. Call of Duty MW3 had similar performance to BF3, while Diablo 3 required dropping the settings below the auto-detected recommendations to avoid hitches and stutters and remain constantly around 45FPS. Battery-wise, the Blade seemed more or less in line with the previous model. Gaming on half brightness got a bit over an hour (67 minutes) going in and out of BF3 servers, while full brightness in one continuous game got 49 minutes in Diablo 3. The performance boost. 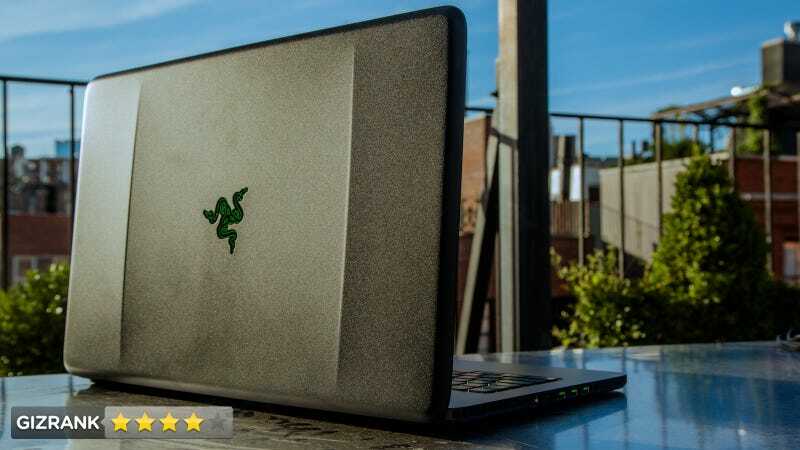 This second stab at the Blade is an actualization of the promise Razer made a year ago: a real, honest-to-goodness gaming laptop in a sleek, portable body. It's still the price. The price-to-performance value proposition would lag far behind comparable laptops—except for the fact that there really are no comparable laptops. This is the most thoughtfully designed, premium-performance laptop you can get, but that doesn't make the $2500 entry level price tag sting any less. It would be easier to swallow if the Blade's performance punched at the absolute top of the gaming division, but it's not quite there yet. Basically all of Switchblade can go here. Switchblade is the Multi-Touch LCD trackpad with an 800x480, 4.05-inch screen on the right side of the keyboard. Ostensibly, it takes the most ignored part of a gaming laptop—the trackpad—and makes it into a useful second screen, with 10 customizable macro hotkeys just above it. In practice, though, the screen's poor viewing angle and small, pixelated text mean it isn't very useful. The in-game apps, like respawn timers in BF3, are decent, but at the same time, not ideal, since you've got to take your eyes off the screen to look down at your trackpad. The sound on the original Razer Blade took a beating—mostly because it sucked. But audio is really, really far down on the list of priorities for a gaming laptop. For whatever it's worth, though, the new Blade is a lot louder and has a halfway decent stereo effect. One of the biggest subtle changes Razer's added is much, much, much better performance while the computer is running on battery power. It circumvented some Nvidia settings to keep pumping max performance, even when you're not plugged in. It's a pretty big deal for portability. The smudging on the anodized black body is really noticeable, and doesn't rub out as easily as on some other black aluminum gadgets. The Blade gets really hot. Like, old-MacBooks-that-set-stuff-on-fire hot. The keyboard—with full anti-ghosting—has enough travel distance to not feel like you're gaming on something aimed at style over performance. Oh! And the power supply—the big ol' brick you attach to the power cord—is actually really, really small for a 120W supply for a gaming laptop. It's a genuinely huge improvement in portability compared to other gaming laptops' chargers. The trackpad buttons, which were a mushy mess, are now slightly better. "Clickier," as Razer says. But they're still not as good as the buttons you'll find on an Asus or Digital Storm or Falcon trackpad. If you are looking for a straight-up gaming rig and don't care about size or looks or weight or practicality or herniated discs, no—god no—you shouldn't buy this. But if you're looking for a laptop that you can use in real life, while also being able to play games with great graphics, and you need those to be the same machine? The Blade actually makes sense for you now. Assuming you can afford it.